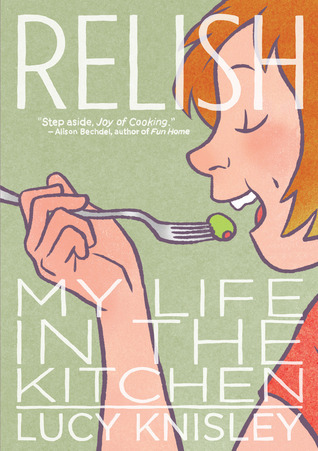 Relish: My Life in the Kitchen by Lucy Knisley. Grades 7 and up. Macmillan Children's, April 2013. 192 pages. Review copy provided by my local library. Lucy Knisley grew up in the kitchen. Raised by foodie parents, Lucy helped her dad make the salad dressing for dinner every night and picked berries in the country with her mom (and also rebelled a little bit by loving junk food). Her strongest memories are tied to tastes and that's what this book is: a collection of tastes from Lucy's childhood, teen years, and young adulthood. It's a perfect dish to serve to anyone who likes graphic memoirs! Warning: reading this book will make you hungry! I am a big fan of graphic nonfiction and memoirs. And hey, I like to eat food! This book definitely hit the spot. Knisley approaches her memoir with a lot of humor and tells interesting stories about her food adventures all over the world. From huevos rancheros in Mexico to pocky and saki in Japan to eating McDonald's in Italy and the quest for the perfect croissants in Chicago, Knisley brings tastes and smells to life for the reader. Each chapter ends with an illustrated recipe, including helpful kitchen information (like adding a little lemon juice to pesto will help keep it green longer). As I was reading the book, I kept reading little bits aloud to my boyfriend, who amiable chuckled along with me. When we did the 48 Hour Book Challenge, I slipped this book into his book stack... and as he was reading, he kept reading funny bits aloud to me, too! So this might be a book with something for everyone, but I'd particularly recommend it to teens and adults who like graphic memoirs and/or love cooking (and eating!). Relish is on shelves now! And hey, it's Nonfiction Monday! Head on over to Shelf-employed for this week's roundup! How cool! My kids love to cook and I love how much they learn from it, math, chemistry, and even world geography.